11.20 Update – I like to post follow ups on these trade ideas so they don’t just go out into the ether uncontested. Not a bad bounce at all. Original post shows weekly chart view while this is daily to show bounce. 10.08 – Last year IPO winner FLTX has given back a significant amount of this years rally from $21-52, pulling back nearly 40%, however when you look at where it’s come from the pullback doesn’t seem so bad. Don’t tell that to those who bought above $40, but trying to chase a stock when it was clearly in pullback mode is very difficult. The good news is I believe given where the RSI is (above 40) that the bullish momentum remains and that when the markets turn around this will be ready to rebound in a big way. 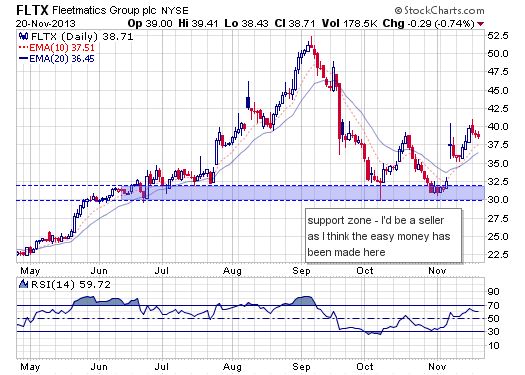 These IPO’s can bounce in a big way as you can see from this XONE trade analysis. Don’t understand your headline. 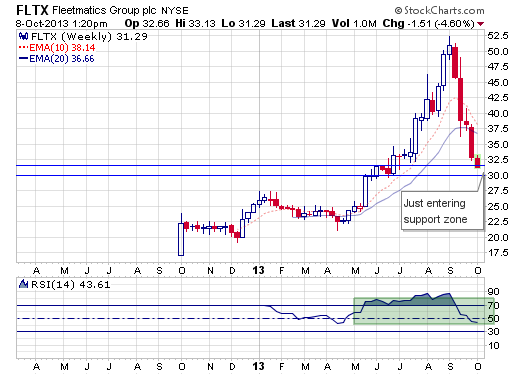 FLTX pullback not IPO related but one-two punch due to lead investor exit and short attack in late Sep. Does this weigh into your analysis? I’m doing a study of “recent IPO’s”, meaning stocks that have IPO’d in the last 6months – 2yrs. That way when I do a search on my site down the road these will come up. I use my blog as a way to track trade ideas for myself as well as share them with others.